Greg Gumbel, Emmy Award-Winning Sportscaster. Community Sponsor. Motivational Speaker. Greg Gumbel returned to CBS Sports in January 1998 as host and play-by-play announcer. Gumbel teamed for six seasons (1998-2003) with analyst Phil Simms to form the CBS Television Network’s lead NFL announce team. He called CBS’s coverage of Super Bowls XXXV and XXXVIII, at the time making him the first and only network broadcaster to call play-by-play and host a Super Bowl. Gumbel then hosted The NFL Today for two seasons (2004, 2005), before returning to the booth to team with Dan Dierdorf, which he has done since 2006. This year marked his 15th consecutive season as studio host of CBS Sports coverage of the NCAA Division I Men’s Basketball. Gumbel, who along with Terry Bradshaw hosted the most popular NFL pre-game show in television history from 1990 to 1993 on CBS, returned as host of The NFL Today with analysts Boomer Esiason, Dan Marino and Shannon Sharpe for the 2004 and 2005 seasons. Gumbel worked for CBS Sports from October 1989 through May 1994. He hosted The NFL Today, the Network’s NFL pre-game, halftime and post-game studio show (1990-1993, 2004-2005), including Super Bowl XXVI (1992). He served as primetime anchor of CBS Sports coverage of the 1994 Olympic Winter Games and as co-anchor of the Network’s weekday-morning broadcasts of the 1992 Olympic Winter Games. Gumbel also served as host of the Network’s coverage of “Speedweeks” from Daytona International Speedway in 1999, as well as host/play-by-play announcer for the College World Series (2000-2002). His other roles have included play-by-play announcer for regular-season and post-season Major League Baseball and host of college football broadcasts for CBS Sports. Gumbel had worked for NBC Sports (1994-1998) as a host and play-by-play announcer. He served as host of The NFL on NBC pre-game show and NBC’s Super Bowl pre-game shows in 1996 and 1998. In addition, he served as host of the pre-game show for the 1994 Major League Baseball All-Star Game and as a play-by-play announcer on NBC’s Baseball Night in America regular-season and post-season games. Gumbel also served as a play-by-play announcer for The NBA on NBC. He was the host of the 1995 World Figure Skating Championships and of NBC’s daytime coverage of the 1996 Olympic Summer Games in Atlanta. While at CBS, Gumbel also provided play-by-play for regular-season college basketball and the NCAA Division I Men’s Basketball Championship, NBA regular-season and playoff games and College World Series championship games. He worked for the network on a part-time basis in September 1988 as a play-by-play announcer for NFL games. Gumbel’s pre-CBS experience includes hosting roles for New York Knicks basketball and New York Yankees baseball for the Madison Square Garden Network, as well as three other weekly MSGN programs. He won a local “Emmy Award” while there. He also has worked for ESPN, WMAQ-TV Chicago, where he won two local Emmys, and WFAN Radio in New York City. 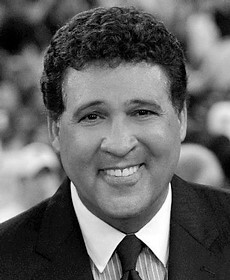 Gumbel was the recipient of the 2007 “Pat Summerall Award” for excellence in sports broadcasting. Gumbel served as a member of the March of Dimes Board of Trustees for 10 years. After completing the maximum two six-year terms allowed, he has served as a member of the March of Dimes National Board of Advisors for the past four years. Gumbel is a member of the St Jude Sports Council, which provides guidance and direction to the mission of St Jude’s Children’s Research Hospital. Gumbel was born in New Orleans and grew up in Chicago. He was graduated from Loras College in Dubuque, Iowa, in 1967 with a degree in English and since October 2009 has been a member of the Board of Regents for his alma mater. He lives in Fort Lauderdale, Fla.